A busy GP surgery or dental practice receives a fluctuating volume of daily incoming calls, which peak at certain times, especially on a Monday morning! 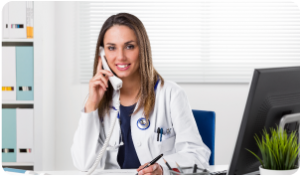 iCS is a telecoms specialist which offers GP surgeries and dental practices bespoke solutions that have improved the overall efficiency of the practice, reduced costs and delivered effective communication, for over 28 years. Needs vary from practice to practice. iCS works closely with Practice Managers to understand the primary duties of the surgery, in particular the needs of their staff and patients. We will then recommend a communications system from a range of manufacturers we work with, which complements the dynamics of the surgery. Staff and patients will see benefits from an array of features. Peak call handling is improved and your practice gains the ability to handle calls from any location, including remote consultations. Our solutions are future proof and will grow as the practice evolves. iCS has been around since 1989 and has gained extensive experience in the healthcare sector. iCS works with a range of providers and understands the market and your needs, meaning we can recommend the best solution to suit your practice enabling you to deliver outstanding patient care. Contact iCS to find out more information to find out how our telecoms solutions will improve the day-to-day running of your practice. Can working from home make you happier…?